As it fundamentally changes the world, globalization restructures the way states, societies, communities, and individuals relate to one another, creating new challenges that cannot be met by nations or markets alone nor understood and overcome using merely one disciplinary perspective. International Studies is an interdisciplinary major that focuses on social transformation and innovative responses to seemingly intractable global problems. International Studies students learn to think across disciplines, to move between the the local and the global, and not to lose sight of the realities of human lives at the center of our investigations. One of UNCW's strategic goals is to "Create an educational environment that prepares our students to be global citizens." Students are prepared to face these global issues, and bring about a more just and equitable world. But just as important is the goal to prepare students to be competitive in the global workforce. Occupations and professions in a variety of settings increasingly emphasize global knowledge, skills, and experience. A deeper appreciation of the global society. "You must be the change you wish to see in the world." - Mohandas Gandhi. Check out what two of our first grads Jordan Eicher and Juliet Wiebe-King said. Then, see what Juliet did with her degree! International Studies is a vibrant departmewnt with a lot of things going on, incluing student participation in the UNCW Peace Corps Prep Program and our showcases of different regions in the world and their global and local connections. Where are International Studies Grads Now? Client Marketing Specialist at ROI Revolution, Inc. 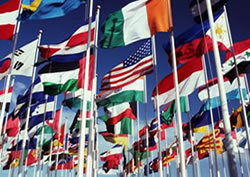 Here is how to declare International Studies as your major or minor.. If you have any questions, email, phone, or drop by the International Studies office to talk to the director. Tuesdays and Thursdays from 11:00 to 1:00 in Leutze Hall 217. Email mastersd@uncw.edu or call (910)962-7583 to make an appointment to meet at other times.